The room watched slack jawed in astonishment. At the same time the voices on the radio got louder and louder. Smitheringale shrieks got louder in return. It was if man and machine were determined to scream each other down. The radio was winning. The screeches from the speaker blasted into the room like a gale. The pitch of the screams was painful on the eardrum. Wadworth and several others cried out in pain. 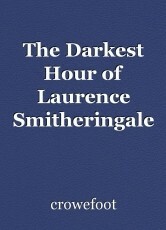 Smitheringale fearful rage collapsed into pure fear. He cringed and turned away. Whimpering he scurried from the room the folds of his black gown flapping. The radio’s screams rose to an intolerable pitch and then went suddenly silent. “What on earth got into this radio.” Tim stroked the Zenith Tombstones wood. “They didn’t say. They just kept shouting- Please let us out. We’re starving. We’re dying.” Channon was staring hard at the radio, stroking at his moustache anxiously. The usually unflappable gentleman’s face was pale with a sheen of sweat was visible on his brow. Wadworth didn’t think the man looked quite as disturbed at the radio voices as Smitheringale was but it was getting in the same direction. “I think I’m getting something now.” said Tim but I had to change the bandwidth. One of the charladies began to quake with emotion. “Oh Flo,” she gasped to her friend and put her hand to her mouth. A ripple of gulps, sniffs and whimpers moved through the crowd. Even the eyes of the manly Mr Lawrence misted over. The whole room was lost in their memories of the last six years, of surviving that daily maelstrom of hope and fear. “I’m sure everything will turn out fine, sir.” Wadworth thought it best not to mention the strange figure skulking in the woods. “Of course it wasn’t, Deidre. And not for my brother either.” Flo took her friend into her arms and the two women hugged and cried. Channon nodded, “Me neither. I think putting Europe back together could be just as hard as the fighting – You two outside I’m warning you. If you make me go out there you’ll regret it!” He shouted as the scuffling and laughing outside continued. Suddenly, the playful scuffling noises were overwhelmed by that of a much more violent confrontation. The corridor echoed with screams of rage and of pain; the unmistakeable whistle then crack of a cane finding its victim. Wadworth and Channon rushed out of the staff room and found Smitheringale dementedly thrashing at a schoolboy. The child was curled on the floor in a ball while the headmaster whipped at him again and again. The other boy was pressed against the wall in terror. The victim was screaming but no louder than Smitheringale. The Headmaster was wailing like a dervish. A lunatic expression contorted his face and tears of rage flowed down his cheeks. “Headmaster stop. You mustn’t.” Wadworth grabbed his hand. “What on earth is going on? What did the boy do Headmaster?” Channon asked. “Headmaster, the boy was in the corridor. He wasn’t outside your window.” Wadworth tried to prise Smitheringale hand from the cane but the fingers stayed fixed there, as if made of stone. Some of the other teachers came out of the staff room. Fullman, the schoolboy, came out too and stared with fascination at the sight of the headmaster having to be restrained like a madman. “I’ll go and look in his study,” Channon went off to the headmaster’s room and Fullman trailed curiously behind him. Then, Laurence Augustus Smitheringale, Headmaster of Kennet Public School, a First Class honours Graduate from Christ Church Oxford, former Professor of Literae Humaniores at Cambridge and author of a hugely admired translation of Agamemnon rested his head on Wadworth’s shoulder and bawled like a baby. Channon put a broad hat on Smitheringale head to try and hide his face as much as possible from the boys and then he and Wadworth walked him down the stairs and out into the quadrangle. The ruckus in the quadrangle was as loud as ever and the scene was now strewn with the debris of the celebration. Wadworth feet kicked through discarded gas masks, thrown food and school caps, fluttering paper streamers. “We’ll have you home and resting soon, headmaster,” said Channon as soothingly as his bluff voice could manage. They walked Smitheringale through the quadrangle as discreetly as they could but Wadworth still noticed some of the boys stop their shenanigans to stop and point. They formed little knots and whispered to each other. Wadworth didn’t have to here to know what they would be saying – I heard he hit Buckly in the face with his cane. Not his backside or his hand - his face! Martin saw him crying- can you believe it? Crying! He must have finally gone nuts! “Uh,” the Headmaster looked up as they took him through his cottage door. The inside was cool and smelt of old paper. The hallway was, like every other room, lined with bookcases. “We’ll leave you in peace here, sir,” said Wadworth. “I promise, Headmaster ,” said Wadworth firmly as Smitheringale’s voice trailed off and he drifted into unconsciousness. They didn’t undress him. They just lay him on his bed, took off his shoes and wrapped him up in his black academic gown as if it was a swaddling blanket. “Yes, sir,” said Wadworth proudly. Channon pondered for a few moments. “A bit strange but probably nothing.” He rubbed at his moustache thoughtfully. “Still those voices over the radio. Those were strange too. Damnably strange.” He closed the door behind him. Wadworth was left alone in the cottage with the headmaster. He was there because he had made a promise. The headmaster was frightened that ‘they’ would come and get him. Wadworth had seen ‘them’ himself, couching sinisterly in the woods. He pulled up a chair close to the Smitheringale’s bedside and kept pensive guard. He watched the headmaster’s face and kept his ears pricked for the approach of whatever had terrified him. No sinister footsteps approached. He looked at the scene out the window. The sun was setting. The cottage’s back garden was edged by barbed wire. The army had requisitioned some of the schools western land and a couple of outlying buildings for its training camp. As a result, the headmaster, who had declined to have even a ticking clock in his cottage lest it disturbed study had been regularly woken by the sound of Howitzers. Wadworth stared out at the gorgeous orange glow that signalled the end of this historic day. It was as unfrightening, unthreatening a picture imaginable. Even the barbed wire and the barrels of the field guns, framed against the sunset, didn’t ugly the picture but were a sweet melancholic reminder that peace was here at last. And you are really going to miss out on the celebrations for the most wonderful day in history to sit and watch Smitheringale sleep? Channon question intruded into Wadworth’s thoughts. From the distance there was another intrusion too; the sound of the celebrations at the school were very faint. He had to listen carefully but he could just hear them. Once he had heard them he couldn’t un-hear them. He looked at the peacefully sleeping headmaster with a certain resentfulness now. He had resented Smitheringale on occasion before. Even someone as expert at repressing feeling for duty as Wadworth couldn’t completely repress resentment at a man so cold, so given to petty obstinacy and so indifferent to humanity beyond the pages of antique folios. But now a thought came that had never crossed his mind even fleetingly in ten years: Did he actually even like this man? Some popping noises outside made Wadworth jump. He rushed to the window but it was no approach of a sinister figure, the pops weren’t the guns of the war restarting. Thatcham wasn’t much of a village but they were excited enough to put on some celebration fireworks. Above the silent guns of the base, delicate little explosions of purple, emerald and indigo fizzed and crackled. Wadworth watched a plume of bright pink burst over the trees near where the road meets the canal. He touched the side of his face where the landgirl’s kiss should have landed. Wadworth tucked the blanket in around Smitheringale neck and shoulders. He took one last look at the slumbering face and walked out of the cottage. He walked up the pathway with a light step, guided only by moonlight and the golden smell of the daffodils. As he got closer to the glow of lights around the school steeples, it was clear from the noise that the boys celebrations were going on as lustily as before. A smile spread across Wadworth’s face as he listened to their joyous shouts and laughter. A glow of freedom and liberation flowed through him. He very rarely drank but his mouth now thirsted for brandy. From where the footpath met the north gate he could see boys had conquered the highest towers and slung flags. Wadworth wanted to cheer for them. “Please, sir.” A close-by voice. A timid squeck contrasting with the uninhibited shouts from the school. Wadworth turned and saw little Fullman peep his curly head from one of the Grecian pillars just inside the gate. “Please, sir. I’m frightened.” The boy’s lip quivered. “Something’s terribly wrong, sir,” Fullman whimpered. There was something in the simple sincerity with which he said it, that way of children to strike at the bare truth with one phrase. Wadworth felt his liberation joy drain away. A cold dread crept through him. A shiver ran through Wadworth as he remembered the brown coated figure crouching at the edge of the woodland path, crouching, watching. Wadworth stood rooted to the spot. The sounds of celebration from the school and the glow of the fireworks that had all been so vivid just moments ago now seemed distant and garbled. The only sensations with clarity were the fear on this little boy’s face, the tears sparkling on his cheeks and his terrified words. Fullman broke down in sobs. “I’m scared, sir. I think something terrible is going to happen.” And then he ran, disappearing into the nest of black shadows that flowed from the columns, urns and statues of the quadrangle. Wadworth stared at the darkness where Fullman had run for shelter. He listen to the close but distant songs and cheers while dread crept through his body. Those little images and sounds from today the figure in the woods, the screeches on the radio, so inconsequential if described to anyone were building up a flow of cold fear. He stood, doing nothing, until from behind him, from the direction of the headmaster’s cottage, he heard a terrified scream. Another scream rent the air, tearing through the soft spring night like a jagged lightning bolt. Wadworth whimpered and tried to go faster, increasing his pain but not his speed. Guided only by the screams and the thinnest sliver of crescent- moonlight, he lumbered through the fug of sweet petal smells until the silhouette of the cottage was in front of him. The details cottage were just visible. Two pairs of heavy boots had tramped through the bed of crocuses in front. The door was flung open. The screams from inside were more discernible as Smitheringale now. Amongst the screams Wadworth could make out whimpered begging, pleas for mercy. “I’m here headmaster. I’ll save you.” His heart was hammering in his chest. He picked a pitchfork that lay propped against a wheelbarrow. His sweat had almost sliding from his grip. He didn’t feel brave but duty was overpowering his terror. This was John Wadworth’s moment. He chased after the boot-prints and shrieks to the back-door which was already flung open. He could hear the sounds of the struggle: bodies thumping and grinding against each other. His own fear which he had thought was already at its limit found a new peak; his body began to shiver like he had been dropped into an ice bath. It struck him that he had never in his life before inflicted physical violence. How was it even done? The two figures who had hold of Smitheringale stopped still at Wadworth words. They had their backs to Wadworth; he couldn’t see their faces. They wore brown leather air-men’s coats and leather caps. They looked tall and strong. A blaze of celebration fireworks lit up the sky and illuminated the garden just as the airmen turned their faces towards him. The airmen had no faces. “Oh my God,” Wadworth screamed. Beneath the airmen’s caps were skulls. Some bare scraps of rotted flesh clung to the bone. Their fleshless jaw-bones opened and from somewhere deep inside - more from their souls than their tattered physicality – emitted hateful, mocking laughter. Wadworth dropped his pitchfork. His inextinguishable sense of duty withered to nothing in an instant. Fear for himself overtook all else. His Headmaster vanished from his thoughts. Wailing in terror, John Wadworth turned and ran as fast as his clubbed foot would carry him.. This page was created in 0.4790 seconds.